Who carved the Paulsgrove Skull? There’s a skull in Portsdown Hill. I don’t know how long it’s been there, but carved on the wall of an old cave there is a spooky face. It is mentioned and pictured by the great local resource Portsdown Tunnels. 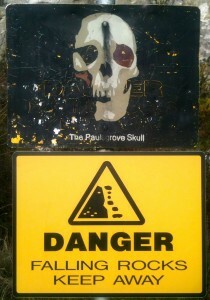 There is also a sign outside which shows a painting of the skull along with a falling rocks sign. Does anyone know anything about this strange thing?